Racism has perhaps featured more than usual in the news cycle of the last few days. 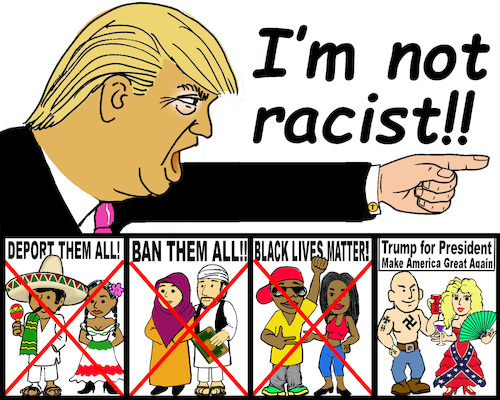 First came Donald Trump’s reference to ‘shithole’ countries, and then after mounting pressure, his declaration that he is ‘not a racist’. As Trump was busy declaring himself ‘the least racist person’, the UK Independence Party (UKIP) found itself under yet more fire from the liberal left (and even some on the right). Leaked text messages, sent by a party activist (who is also the partner of the party’s leader), referred to ‘negros’ as ‘ugly’ and suggested Meghan Markle’s ‘seed will taint our royal family’ (a remark revealing Marney to be painfully ignorant to the ‘colourful’ history of the royal family). In response, UKIP suspended the indefensible Jo Marney. The furore that has followed both Trump’s comments, and Marney’s texts, show that, as a society, we are far more able and willing to condemn explicit racist remarks than we are the institutional, structural and oft-less visible forms of racism that permeate our society. Whilst it might serve the purpose of appeasing the white conscience, a narrow focus on explicit racism is incapable of tackling racism in meaningful ways. In this sense, the condemnation of Trump and Marney has been little more than hollow rhetoric that fails, perhaps through wilful ignorance, to grapple with the magnitude of the issues in question. The question has to be whether or not the outraged are serious in their outrage, and therefore whether as a society we are serious about tackling racism and racial inequality. If we are, then the lens through which we view racism, and the scope of what is outrageous, will have to drastically change. A more sophisticated analysis of racism allows us to see Trump and Marney’s texts as nothing more than the visible tip of the white supremacist iceberg: had society been able to adopt such an analysis, should UKIP and Trump not already have been opposed and condemned to the point of irrelevance? It is that which lies below, structural racism, that has such profound implications for the lives of Black and Brown communities. It is structural and institutional racism that keeps so many of our people locked out of key social institutions, and structural racisms that Trump’s Republicans and Marney’s UKIP are so boldly in pursuit of. Structural racisms mean that disproportionate numbers of Black and Brown people are un(der)employed, living in poverty, in substandard housing, and suffering from poor health. Structural and institutional racisms mean that Black and Brown people are staggeringly overrepresented in statistics for school exclusions, incarceration, and in incidences of police brutality. It is the structural that means that global wealth disparities are so stark, and that these disparities manifest in such clearly racialized ways. Should it not be these patterns of inequity that arouse collective outrage? Should outrage not come in response to governments that have no desire to address these inequities? Focusing on the structural allows us to see the ways in which racism is maintained without the need for explicit racist remarks. Eduardo Bonilla-Silva has characterized society as one of ‘racism without racists’: a society in which, whilst nobody readily professes to being a racist, racism continues seemingly unabated. Such an analysis shows us that the policies, rhetoric and practice of Trump’s government are far more impactful than whether or not he openly professes to be a racist. Whilst Theresa May and the Conservatives (except, of course, Boris, who seems to be able to say whatever he likes, no matter how explicitly racist) would be less likely to say things as explicitly racist as Trump, their policies and more-implicit rhetoric continue to do great harm to Black and Brown communities. Whilst the outraged find it easy to condemn Trump, where is the commensurate condemnation of the Tories? What kind of a society allows a party to maintain power when it has such devastating consequences for Black and Brown communities, working-class communities, and disabled communities? Seeing racism as being about more than explicit remarks allow us to hold UKIP to task even as they try to distance themselves from the racist image that (quite rightly) haunts them. Sacking and condemning Marney is a mere performance, but will UKIP ever condemn (rather than perpetuate) structural racisms? Absolutely not! If society remains only able to condemn the explicit, racism will continue to flourish. We must draw upon more holistic and nuanced understandings of racism as we strive to overcome.